This book examines how the law has limitations to the extent that it can combat repression, isolation, and inequality. The main point the book explores is that isolation and inequality cannot be solved by driving up wages and having better working conditions. The true divide between management and workers is the inability of management to see the workers as people, and not just numbers. "The Swiss novelist Max Frisch remarked at the time, ‘We imported workers and got men instead.’" This encapsulates the dilemma of management – how to distance one’s self enough from workers to command respect yet not too distant as to be seen as inhumane. 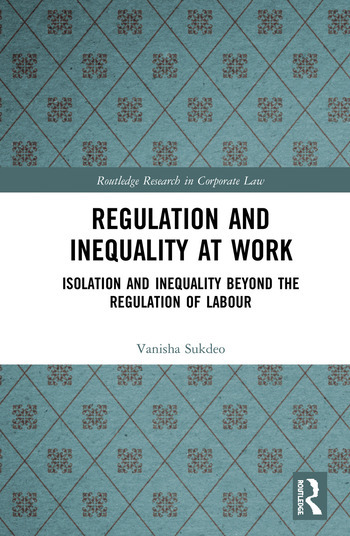 How can isolation and inequality within the workplace be overcome? Regulation and Inequality at Work shows how workers can have an increased voice by using tools outside of the typical legal ones. Without state protection, the rights can be viewed as less stringent. Working outside the system allows for greater malleability and flexibility to be able to cater to individual workers in individual workplaces. Workers’ rights are about better working conditions, hourly wages, and benefits, but are also about being treated in a more civilized manner where one’s humanity is recognized. Only through all of these parts working together will a true version of workers’ rights emerge—one where workers are not viewed as mere tools but within and of the system itself. It shows the latest state of knowledge on the topic and will be of interest both to students at an advanced level, academics and reflective practitioners in the fields of business and company law, labour law, and employment law. Workers in Developing Countries: Is An Obligation Implied or Imposed? Employees, Workers, or something else entirely? Let me talk to your manager – wait, you don’t have one? No manager. Who trained you? The Gig Economy or the Rig Economy?